Named after the Roman Emperor, Elvio Pertinace, this small cantina sociale is found in Località Pertinace, Treiso, on which spot he was apparently born in 126 AD. Some years later, in 1973 AD, ‘Pertinace – Cantina Vignaioli di Treiso’ was founded by Mario Barbero, whose son Cesare now runs the business on behalf of seven families (17 socii). The Cantina looks after 100ha of vineyards, of which 50ha are devoted to Nebbiolo da Barbaresco. 90% of the vines are located in the comune of Treiso, while 10% are to be found in the comune of Barbaresco, Alba & Magliano. Their first vintage of (blended) Barbaresco was released in 1969, & in 1978 they first released the range of three single vineyard Barbarescos from Treiso: Castellizzano, Marcarini, & Nervo. Indeed they focus on four, traditionally made Barbarescos: a classic blend of 10 vineyards from Treiso (90%) & Barbaresco (10%), plus single vineyard expressions from Treiso: Castellizzano, Marcarini, & Nervo. Stainless-steel vertical (alc & MLF) fermented, followed by 18 mths in 40 – 105HL slavonian botti grande. They also make a Langhe Nebbiolo, plus a delightful Dolcetto d’Alba blended from Treiso, Neviglie, Altavilla, & Madonna di Como fruit, & a Langhe Arneis from Treiso, Trezzo Tinella & Altavilla (Alba). Lots of exciting developments here. Since vintage 2013 they’ve employed the ‘cappello sommerso’ (submerged cap) method to allow a longer maceration (up to 60 days), & better tannin integration. In 2014 they opened a new bottling & dry goods warehouse next to the cantina. 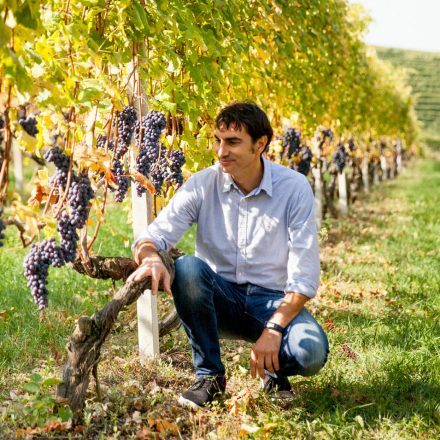 In 2016, a local lad & enologist Stefano Giordano joined as the winemaker. In the vineyard, from 2018 they are certified SQNPi (Sistema di Qualità Nazionale Produzione Integrata), & in the same year they opened a new grape reception/destemming area, & began to replace 4 botti/year with new Garbellotto barrels. And in 2019, Elena Oberto assumed responsibility for hospitality. 2018 Langhe Arneis – tasted March’19, 13%, from vineyards high up in the villages of Treiso & Trezzo Tinella, plus from a plot in Altavilla (Alba), the 2018 vintage is refreshing & cool, with distinct, lime-stone, lime spremuta, & floral tiglio (lime flower) fragrance too. Crunchy white stone sapidy & lime cordial (!) intensity. Sealed with DIAM5. 2018 Dolcetto d’Alba – tasted March’19, 13.5%, a delightful, juicy blend from their vineyards in Treiso, plus fruit from Neviglie, Altavilla (Alba), & Madonna di Como (Alba). Bright, vibrant, UViolets, juicy, sapid, & generous too. Ready to go. Sealed with DIAM5. 2017 Langhe Nebbiolo – tasted March’19, 14%, a blend of fruit largely from Neviglie (40%) & the remainder from Altavilla (Alba), Magliano (15%) in the Roero, & Madonna di Como (Alba). Vibrant, crunchy, fresh but gentle raspberry, rose petal fruit; the dashing Neviglie fruit core effectively coming from the Barbero family’s Castellizzano vineyard at 300m asl that straddle the Treiso/Neviglie border, losing its MGA in the process. The Magliano (Roero) share (c.15%) giving a welcome mid-palate summer red fruit softness & ‘easy-on-the eye’ quality for immediate consumption, backed by the sunny 2017 vintage. 2016 Barbaresco – tasted March’19, 14.5%, bottled Feb’19, a refreshing blend from 11 separate vineyards, 90% of which lie in the comune of Treiso, plus 10% from Barbaresco. They are from Treiso: Giacone, San Stunet, Ausario, Giacosa, Casot, Pajorè, Valeirano, Bricco, Marcarini, & Nervo; plus from Barbaresco: Ca’Grossa. Very much a traditional co-fermentation of the diverse vineyard fruit (alc & MLF) in stainless steel, followed by 18 months in 40-105HL slavonian botti grande. Bright, blush pinky red; the nose is uplifting, spiralling, with fine, floral, rose petal, a hint of sandalwood, soft strawberry charm, & classic Treiso high-toned, breezy little red fruit – dashing! And so on the palate, there’s lots of ‘spangly’ red crunchy fruit, plenty of energy, it’s lively, racy, with cleansing transparency, sapid, a lovely rose/raspberry resonance, well-integrated structure & lunghezza! Favoloso! 2016 Barbaresco Castellizzano, Treiso – tasted March’19, 14.5%, bottled Feb’19, vinified in exactly the same way as all their Barbarescos, here from the single, Treiso, 1.2ha vineyard of Castellizzano that lies at 330m asl, on reddish sandy clay facing (Neive’s) Basarin across the valley. It’s a very open, breezy site, facing East, planted in the 1970s at a traditional 3.5k plants/ha. Refreshingly different from their blended Barbaresco, the face of Castellizzano is: a more intense red garnet, with orange complexion; the nose is riper, has a warm glow about it, with swollen strawberry fruit, supple, refined, tranquil, with distinct, clearly articulated, ripe summer fruit & sandalwood notes; the palate is as you’d expect, soft focus summer fruit, but with tonic; suave & pulpy, ‘piu grasso’, very easy on the eye, an almost mentholated ripeness, warmth yes, but clearly defined & elegant. A Treiso Barbaresco, yet perhaps leaning towards the terroir of Neviglie on whose border this vineyard lies? 2016 Barbaresco Marcarini, Treiso – tasted March’19, bottled Feb’19, vinified in exactly the same way as all the Barbarescos (with 60 days submerged cap)…so diametrically different from Castellizzano, Pertinace own the sweet spot of this 320m asl high Treiso vineyard, Marcarini, that gazes WSW, on a fine tilth of sandy calcareous clay. It’s named after the ‘borgata’/hamlet that lies above the vineyard on the road that runs along the ridge to Treiso. A brighter, more translucent, high-toned rose red suggests more active calcium in the soil. This is confirmed by the vertical, soaring aromas of little red berries, rose petals…cologne even. More ‘esile’/ethereal & scented than Castellizzano. Without wishing to sound fanciful, there’s an Asili character to this wine: lots of tightly packed little red fruit, white talc soils…do we have another ballerina?! Love its presence, that dances/remains light on its feet, it shows great energy, racy…pacy…textbook Treiso tension, yet all the while precise, but not overly technical, relaxed, happy in its skin. Exciting! 2016 Barbaresco Nervo, Treiso – tasted March’19, bottled Feb’19, vinified in exactly the same way as all the Barbarescos (with 60 days submerged cap), again so refreshing to taste such a pure & different vineyard expression; one that’s evidently been carefully understood, & then articulated by the new winemaker, Stefano Giordano. The wonderfully, & aptly named Nervo vineyard also lies at approx. 320m asl, but this time it’s on the pure South facing flank of a ridge closer to San Rocco Seno d’Elvio, & soils are not the sandy calc of Marcarini, but distintly blue marne, heavier, & more water retentive (as there’s a spring just above, apparently!). The Pertinace vignaioli own a fabulous (sunset) strip that winds its way, mid slope along the upper part of the Nervo cru; the same way as Monprivato does in Castiglione Falletto! Little surprise then that Pertinace’s Nervo should show such an intense (royal) blue hue to its garnet red, so completely different to that of their other Barbaresco. More blue, more profondo, deep as the mare, there’s a distinct sense of ‘pienezza’ to this wine; much fuller for sure. Unsurprisingly, the nose is relatively closed, reticent, austere even, more ‘maschio’ to Marcarini’s ‘feminile’ . To taste there’s a deep, almost dark cherry kirsch character, shrouded in a comparatively muscular structure, flesh yes, but nervous (!) energy running through it. Re-assuringly the most difficult to read of the four Barbarescos at this early stage (straight after bottling), difficult too to coax out at this stage…an attribute that bodes well for future development in bottle.